Tonight, we surveyed what was left from the farmer's market and we came up with butternut squash, leeks, corn, and parsley...we had the choice of Israeli couscous or quinoa, and we decided to go with the couscous. This simple dish was delicious! If I were to make it again, I would substitute half the water for a dry white and add some garlic. 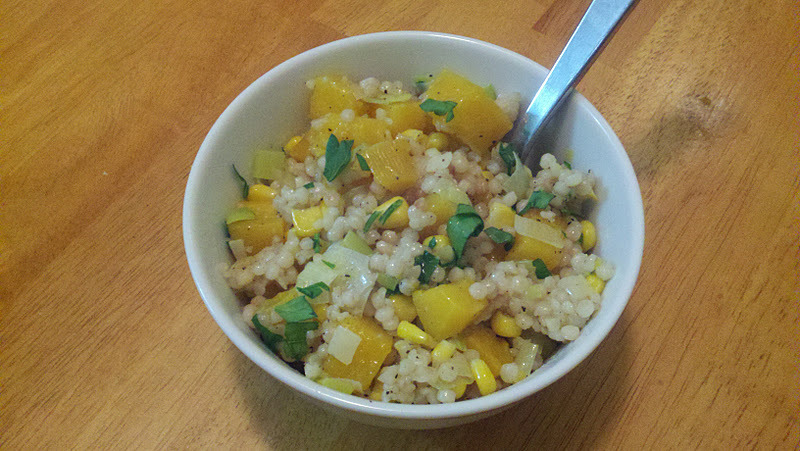 Prepare Israeli couscous and set aside. Preheat oven to 350°F. Oil a rimmed baking sheet. Toss squash cubes and enough olive oil to coat in a medium bowl. Spread squash in single layer on prepared sheet; sprinkle with salt and pepper. Roast just until tender but firm enough to hold shape, stirring occasionally, about 15 minutes. Transfer squash to bowl. Cool. Melt 4 tablespoons butter in large skillet over medium heat. Add leeks and 3/4 cup water; simmer until leeks are tender, about 7 minutes. Add corn; simmer 2 minutes longer. Add couscous and butternut squash; simmer until heated through and liquid is absorbed, about 4 minutes. Stir in 1 to 2 tablespoons olive oil and parsley. Season with salt and pepper. Transfer to bowl and serve.